Dana Russell fulfilled a lifelong dream 10 years ago by becoming a Licensed Massage Therapist and thus created Tranquil Massage. Dana worked in local spas until the universe reunited her with a past colleague, Dawn Judkins. Dawn, now a Reiki Master, was in pursuit of new location for her practice. Together they established a wellness center under the heading of On the Right Path. Over the next several years, On The Right Path offered several different healing treatments which included the addition of the The Salt Mind and the use of Himalayan Salt elements. During the following six successful years in practice, Dana’s Tranquil Massage was voted first as “Best in the Region” for Best Massage Therapist in 2015 along with On the Right Path third place status as Best Day Spa. Three years ago, On the Right Path made another transition. Dawn incorporated belly casting into her practice. As a result, she decided to step away from day to day workings of On the Right Path and to pursue her degree in art and as of June 2, 2017 Dawn earned a Bachelor of Arts degree with a concentration in oil painting. Dana, with the encouragement of her husband Greg (and new business partner), spent those three years in pursuit of creating their own Himalayan Salt Cave. They traveled, researched locations and visited over 10 different salt caves around the country. With due diligence, the Russell’s have established Adirondack Salt Cave LLC which is located in downtown Glens Falls. 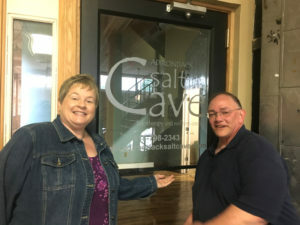 Adirondack Salt Cave is a Halotherapy and Wellness Center that focuses on Halotherapy or dry salt therapy with the benefits of being in an actual Himalayan salt cave. Dana will continue taking appointments for massage but will add managing the day to day operations of the Adirondack Salt Cave. Greg will be handling the administrative duties. Massage, Reiki, belly casting, and an Esthetician will continue to be available at the Adirondack Salt Cave. We would like to thank the many amazing mentors that with their guidance & support throughout this adventure has made this dream a reality.